11) Friday the 13th (1980): This sleeper hit capitalized on the formula established in 1978’s “Halloween” and became a pop culture event in itself, launching countless sequels, remakes, and a television series! I no doubt have seen it two dozen times, and it still holds up – even moreso if you don’t know the premise. But since everyone on earth does, I don’t consider a spoiler alert necessary before summarizing it here: 20 years after a summer camp closed following the drowning of a local boy and the murder of two camp counselors, Camp Crystal Lake has new owners and is set to open once more. The camp’s latest group of counselors – including none other than Kevin Bacon – take turns painting cabins, smoking pot, cutting trees, playing strip poker, and getting killed by an unseen killer. Is it Jason Voorhees, long presumed drowned? Is it Crazy Ralph from the closest town? Or is it someone more maternal, someone with a literal and figurative axe to grind? Terrific mood music by Harry Manfredini makes this movie, as does its scream-inducing, “Carrie”-esque ending. 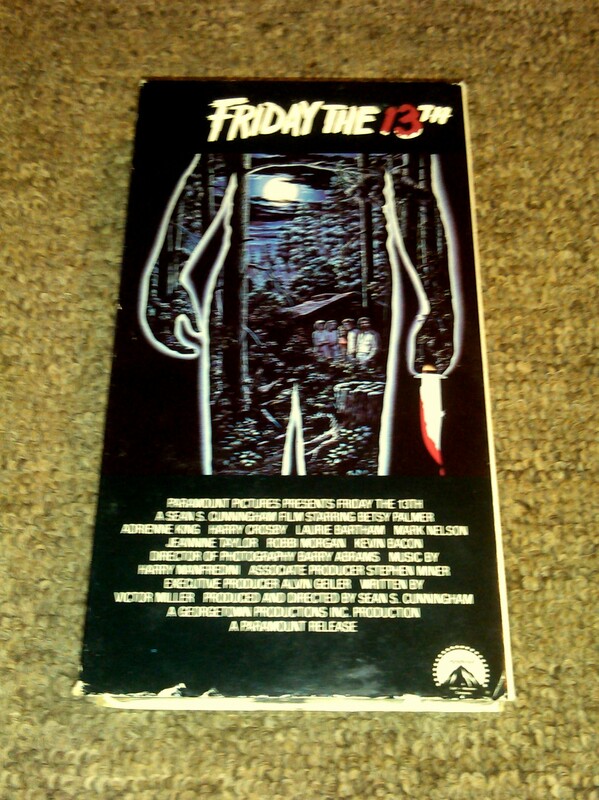 And yes, the picture above doesn’t lie: I own “Friday the 13th” on VHS! If you like this, see also: “Friday the 13th: The Final Chapter” (1984), “Sleepaway Camp” (1983). 12) Rosemary’s Baby (1968): Surely one of the best movies of the late 1960’s, “Rosemary’s Baby” is a perverse, unsettling drama that holds up well today. If you don’t know the story by now, it is an Oscar-nominated screen adaptation of Ira Levin’s novel, revolving around naïve newlywed Rosemary Woodhouse (Mia Farrow), who moves with her actor husband Guy (John Cassavetes) into a New York high-rise populated by eccentric neighbors like Minnie Castavet (Ruth Gordon, who steals the movie). After one particularly amnesiac night, Rosemary learns that she is pregnant, and when Minnie and others take more than the usual amount of interest in the unborn child’s nourishment, Rosemary suspects that her hell-spawn really is a hell-spawn, possibly part of a Satanic pact between her husband and the Devil in exchange for success as an actor. Slow-burning suspense builds to an unforgettable ending and assured direction by Roman Polanski at the top of his game. If you like this, see also: “The Devil’s Advocate” (1997), “The Stepford Wives” (1975). 13) The Mist (2007): Stephen King’s movie adaptations don’t always resonate with viewers. Some, such as “Pet Sematary,” suffer from bad acting, while others, like “Graveyard Shift,” are incomprehensible all around. But SK is still responsible for helming novels that were the basis for several memorable films. This is the third King movie to make the Top 20, and it is a master class in creating a claustrophobic atmosphere. It is also a reminder that if you’re going to depart from the source material’s ambiguous ending, then you should do so boldly. Thomas Jane leads a strong cast that also includes several future regulars from “The Walking Dead,” all of whom play supermarket customers trapped inside the store after a mysterious mist, filled with supernatural beasties, enshrouds their small New England town. As with “TWD,” we soon begin to wonder which is more dangerous: the monsters in the mist or the monsters inside us all. I am talking about you, Marcia Gay Harden. “The Mist” is about as bleak and suspenseful as a mainstream horror movie can be…and I highly recommend it. If you like this, see also: “The Thing” (1982), “The Fog” (1980). 14) The Sixth Sense (1999): “I see dead people. Walking around like regular people.” That reveal, confessed by young Cole Sear (Haley Joel Osment) to disgraced child psychologist Dr. Malcolm Crowe (Bruce Willis) comes almost an hour into this movie. Indeed, the kid’s torment is that he sees ghosts of the recently-deceased, many of whom died in disgrace and simply want his help to tell the truth. Poor kid. There is an even bigger twist towards the end of this slow cooker of a film, and it was accidentally spoiled for me before I saw this movie. But I still loved “The Sixth Sense.” Willis and costar Toni Collette (as Cole’s mom) give the best performances of their careers, and Osment, in his first film, is a revelation. I almost didn’t include “The Sixth Sense” on this list because it is as much a love story as it is a ghost story, and a PG-13 one at that. But omitting this film would be a discredit to the cast and to writer-director M. Night Shyamalan, who hasn’t done anything as interesting before or sense. If you like this, see also: “The Others” (2001), “Stir of Echoes” (1999). 15) The Birds (1963): This leisurely-paced, Technicolor creeper is easily one of director Alfred Hitchcock’s ten best movies. (A blog a post for another day, perhaps?) The movie was loosely adapted from Daphne du Maurier’s 1952 short story, but is more inspired by actual events from 1961, when thousands of birds crashed into Capitola, California rooftops after dining on poisoned shellfish. The seaside town in the movie was changed to fictitious Bodega Bay, and the Hitchcock blonde at the center of the action was Tippi Hedren, in a memorable screen debut. The suspense builds slowly, the bird attack sequences genuinely frightening, and the cast – also including Rod Taylor and Jessica Tandy – impressive. All that being said, “The Birds” is really a commentary on the invasion of cold, WASPy, small-town America by suspicious outsiders – human and avian both. Fun fact: “The Birds” was a 1991 inductee into the Robert Englund-hosted Horror Hall of Fame. If you like this, see also: “Arachnophobia” (1990), “Rope” (1948). 16) The Omen (1976): This chilling film is in a similar vein as “The Exorcist” and “Rosemary’s Baby” in that it deals with possessed or (in this case) demonic children. The hell-spawn in this case is Damien, who we first meet when he is adopted as an infant by a U.S. Ambassador Robert Thorn (Gregory Peck) and his wife Katherine (Lee Remick). What Robert knows but Katherine does not is that Damien is not the child she thought she gave birth to. That child died moments after it was born, and an overzealous priest suggested to Robert that he switch the baby for another newborn whose mother died in childbirth. Robert agrees, not suspecting that the strange “666” birthmark on Damien’s scalp is actually an omen of things very, very demonic. Suspense builds slowly – dogs growl at Damien and the kid refuses to enter a church; later his nanny hangs herself. Shivers shoot up your spine. Interesting bit of trivia: William Holden was once considered for the role. He turned it down, supposedly stating that he didn’t want to be associated with a movie about the devil…and then took the lead role in the sequel. If you like this, see also: “Damien: Omen II” (1978), “End of Days” (1999). 17) The Descent (2005): Leave it to the Brits to produce the most intense, claustrophobic movie on this list. “The Descent” is a 2005 UK indie (U.S. release: 2006) with a bare-bones premise: Six spelunking women enter an unmapped cave system in the Appalachian Mountains, become trapped, and realize that they share the cave with blind, flesh-eating bipeds. The naturalistic darkness makes it hard to identify which woman is which, but we know that recently-widowed Sarah (Shauna Macdonald) has an axe to grind with Juno (Natalie Mendoza), whom she suspects of having an affair with her late husband. Not that any of this matters; survival is the name of this game. Gruesome, scary, unrelenting, and boasting a strong, all-female cast, “The Descent” is one of most thrilling surprises from the horror genre in years. If you like this, see also: “The Descent Part 2” (2009), “Scream” (1996). 18) A Nightmare on Elm Street (1984): With apologies to the recently-departed Wes Craven, “A Nightmare on Elm Street” has not aged well. For one thing, the synth-heavy score reeks of 1980’s cheese. For another, the acting is universally bad. That said, it merits inclusion for its contribution to the horror film as pop-culture phenomenon, and for its premise, which is admittedly cool: Elm Street children – the sons and daughters of parents who took the law into their own hands and burned neighborhood child murderer Freddy Krueger to death – are now being stalked by Freddy in their dreams…and if they die there, they die in real life! Today, the movie is most acclaimed as featuring Johnny Depp’s breakthrough role, although even he is wooden here. Only Robert Englund, who appears to be having a blast, seems in on the campy joke. His best line: “I’m your boyfriend now, Nancy!” The movie spawned a series of uneven sequels, but of greater interest is the fact that the similarly-themed “Dreamscape” (starring a young Dennis Quaid), opened the same year. If you like this, see also: “A Nightmare on Elm Street 3: Dream Warriors” (1987), “Dreamscape” (1984). 19) An American Werewolf in London (1981): This sleeper hit is a rarity for the genre: a critically-acclaimed Oscar winner. The Academy of Motion Picture Arts & Sciences awarded its first-ever Oscar for Outstanding Achievement in Makeup to Rick Baker, who turned the character of David Kessler (played by relative unknown David Naughton) into a werewolf. The astonishing transformation sequence in the middle of the film is a thing of legend, a high watermark for the genre then and now. The movie itself? It is a goofy romp with uneven (oft-comedic) tone and several staples of 1980’s cinema, a shower scene and a car crash among them. Naughton’s David is an appealing protagonist, as is his gone-too-soon buddy Jack Goodman (a very funny Griffin Dunne), who was killed – and David bitten – following a vicious, full moon attack by a werewolf on Britain’s moors. A horrible sequel, “An American Werewolf in Paris,” was released 16 years later, but it was related to the original in name only. Far better is another werewolf movie from 1981, “The Howling.” If you like this, see also: “The Howling” (1981), “The Wolfman” (2010 remake). 20) The Blair Witch Project (1999): Some might say that by including “TBWP” on this list, I have lost any credibility as a critic. But I maintain that this “found footage” sub-genre entry, the first of its kind, earns its stripes. For one thing, it came out of nowhere in the summer of 1999 to out-gross Stanley Kubrick’s swan song, “Eyes Wide Shut,” at the box office. For another thing, its documentary-style look, all handheld cameras, succeeds at drawing viewers into the story. And for another, the ending is scary as hell. If you haven’t seen it, it begins with a title card informing viewers that three students set out into the Maryland woods to film a documentary about the reclusive “Blair witch,” and were never heard from again, aside from the video footage that unfolds: creepy images of humanoid stick figures hanging from trees, arguments after getting lost in the woods, and nocturnal encounters with unseen forces shaking their tent. For better or for worse, it brought about a renaissance for the horror genre, and influenced dozens of filmmakers. If you like this, see also: “Paranormal Activity” (2007), “Sinister” (2012). Questions? Comments? Agree? Disagree? Let your fellow readers know by posting a comment…and Happy Halloween! I’m not a huge fan of horror movies (especially the “slasher” variety), but my favorite is probably “El espinazo del Diablo” (The Devil’s Backbone) by Guillermo del Toro. Del Toro is well known here for “Pan’s Labyrinth”, but I thought “The Devil’s Backbone” was even better. It’s a ghost story that takes place in an isolated orphanage in Spain during the Spanish Civil War. A very eerie movie! If you’ve never seen it, check it out. I do like Hitchcock, and have seen “The Birds” several times. Thanks for that background information (birds eating poison shellfish)… I didn’t know that. You’re not the first person to recommend “The Devil’s Backbone.” I loved “Pan’s Labyrinth,” and it didn’t miss making this list by much. Hitchcock made so many influential films. Only a couple are all-out horror, but every single one has a “thriller” element to it. Loved the Mist. Not a huge fan of the Omen. I wish I could go into deeper film analysis, but all I remember was that I wasn’t too crazy with the original, and the remake was even worse. Following Rosemary’s Baby and the Exorcist, the late 60s and 70s were the golden era of the satan/possession sub-genre, but The Oman failed to deliver. PS…as much as I loved the Mist, I’m conflicted whether I should consider it “horror” or “science fiction”. There’s films that are considered to belong to both these categories, but I’d describe it as more of a “sci fi thriller”. I agree that some movies cross genres, but I think “The Mist” is all-out horror. “John Carpenter’s The Thing” is more of a hybrid, to name just one. Thanks for commenting. Glad you’re a fan of the movie. You should read the novella. I, too, love a good horror-comedy. “Evil Dead II” and “Zombieland” are my faves in that regard. Remind me to tell you sometime about the tongue-in-cheek horror musical that I am writing – think “Once More, with Feeling” from BTVS. And yes, “House of Wax” is a classic. House of Wax made a huge impact on me as a kid. I was totally haunted by it. I was also traumatized by Invasion of the Body Snatchers when I was babysitting my siblings around age 12 or 13. The kids were asleep and I knew my parents wouldn’t want me to watch it, but I did. I regretted it. Never rewatched it. I also had a really strong reaction to Amityville Horror when I was 14 or 15. Watched it again as an adult and it had no real effect. Weird. House of Wax was great fun. Amityville Horror was boring.